Freeport Outlets provide a great way to shop world class stores and boutiques right in Maine. Try great food, shop from the top stores including L.L. Bean, and experience some of the great things that Maine has to offer. Before you head out to the Freeport Outlets, here’s what you need to know. The Freeport Outlets are known for the many great stores and boutiques that they offer. Check out international brands and some of the top names in fashion and more. Stores included at the Freeport Outlets include: J. Crew, L.L. Bean, Calvin Klein, Nike, Ralph Lauren, Tommy Hilfiger, Coach, North Face, Brown Goldsmiths and more. Make sure to bring the whole family when visiting the Freeport Outlets because there are options for everyone. Many of the outlet stores have discounts and sales that are hard to find anywhere else. This is a great opportunity to shop at some of the best known stores but not have to pay the full price. If hungry at the Freeport Outlets, there is a Dairy Queen and Johnny Rockets that offers food options. The Freeport Outlets are open from 9 a.m. to 9 p.m. from Monday through Saturday and 10 a.m. to 7 p.m. on Sunday. There are over 500 covered parking spaces for free in garages provided at the Freeport Outlets. Garage entrances are on Mill Street and Depot Street. The Freeport Outlets have coupons and offers available on their website. L.L. Bean is a staple brand that is based in Freeport. The brand has an outlet store in the Freeport Outlets which is not far from the flagship store in Freeport. The outlet store is open seven days a week The flagship store is open 24 hours a day, seven days a week and is a major tourist destination in the city of Freeport. The company offers events like music and celebrations and also has outdoor classes that are great to attend and are informational. From Dockside Guest Quarters, the Freeport Outlets are about an hour drive north and are just a few of the opportunities for shopping in Freeport. The drive this time of year is a perfect opportunity to enjoy the beautiful Maine fall foliage. 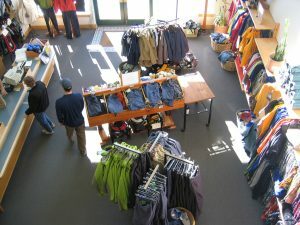 The Freeport Outlets are one of the many great things to visit while you are in Maine. To ensure you see everything, make sure to book a stay at Dockside Guest Quarters so you enjoy them all. Not only do the accommodations offer timeless style combined with modern comforts, but when you stay you also get breakfast from our bountiful buffet each morning, ensuring that your days will start off on the right note. Our Dockside Restaurant is perfect for a great meal. For an all-around good time in coastal Maine, stay at Dockside Guest Quarters. We can’t wait to see you soon! The Freeport Outlets are just another great reason to visit Maine. Visit our things to do in York Maine page for more information on what to do and see while you’re with us.